Earlier this month, two teenage girls died at the HARD Summer music festival in Ponoma, California, reportedly from “suspected drug overdoses.” Less than two weeks earlier, an autopsy confirmed suspicions that Nicholas Austin Tom, a 24-year-old Californian who died at the Electric Daisy Carnival in June, died due to MDMA intoxication. The deaths are only the latest in a string of drug-related fatalities linked to EDM concerts in recent years – part of a trend that’s led to a major shift in the live music industry. Some festivals have responded to the mounting pressure by bending toward zero-tolerance drug policies: After two people died at Electric Zoo in 2013, the festival required the following year’s attendees to watch a D.A.R.E.-like anti-Molly PSA and stepped up law enforcement efforts with drug-sniffing dogs and heightened gate security. 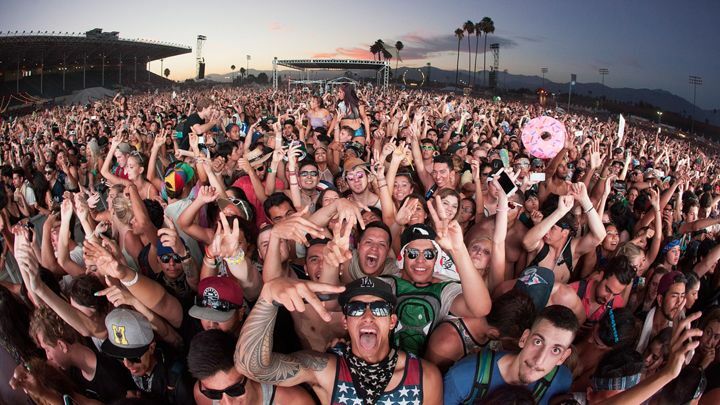 Following the deaths at HARD Summer, one Los Angeles County official went so far as to suggest a temporary ban on raves. At the same time, some organizations have taken another approach: acknowledging the prevalence of drugs in the scene and working to integrate harm reduction services on-site at festivals. Two of the most prolific such groups are DanceSafe, a drug-education organization with a bent towards checking the chemical makeup of drugs, and the Zendo Project, an initiative that provides safe spaces for people undergoing unpleasant psychedelic experiences. Since its inception more than 15 years ago, DanceSafe has provided harm reduction services like clean snorting straws and condoms to partiers across the country. The group has also dedicated itself to raising awareness about the environmental conditions that can lead to medical emergencies for MDMA users. These emergencies are rare compared to other drugs, and in most cases, they are preventable; while there is no comprehensive national data on MDMA-related fatalities, it is generally understood that a very small percentage of use results in death. The most common cause of MDMA-related death is hyperthermia, or over-heating. Dehydration and over-hydration can both be risk factors as well. Experts advise that users of the drug should be mindful of cooling down and staying hydrated, but focus on consuming electrolytes rather than large quantities of water, which can cause more harm than good. Most controversial in psychedelic harm reduction is DanceSafe’s establishment of drug checking kits on-site when allowed – a harm reduction strategy they compare to syringe exchange for intravenous drug users. While DanceSafe’s reagent tests cannot check for potency or purity, they can detect the primary composition of a drug, and thus provide the user with the information to decide whether to take it, and to understand the health risks if they make that choice. User experiences on MDMA and cathinones can be similar, and so are the risk profiles. For people who have limited or no experience with MDMA, it can be hard to tell the difference. “Most drugs misrepresented as MDMA would probably trick you at least enough that you wouldn’t immediately go back to the dealer and demand your money back,” Gomez says. According to Gomez, Molly samples have tested positive for a variety of known drugs, as well as new substances DanceSafe had not catalogued before. Misrepresented substances include “shotgunned combinations of stimulants” of varying proportions that “look like somebody took whatever stimulants they had lying around that day in whatever proportion they had them lying around and pressed them into a pill.” Sometimes, DanceSafe sends samples back to a more elaborate lab to identify new substances. Gomez says DanceSafe is essentially playing the same catch-up game as police – it’s next to impossible to stay ahead of rogue chemists who are constantly creating new substances. Some events, like California’s Lightning in a Bottle and Portugal’s Boom Festival, have become models for psychedelic harm reduction for their integration of services like drug-checking, trip-sitting and education on how to stay cool, hydrated and calm during a festival. In Europe and Canada, where harm reduction has become more mainstream, drug-checking and other risk minimization techniques are common. One obstacle to enforcing this model across the U.S., advocates say, is the Illicit Drugs Anti-Proliferation Act, passed by Congress in 2003, which imposes harsh fines on event organizers who allow or encourage drug use on their premises. (The bill is frequently known as the Rave Act, or Reducing Americans’ Vulnerability to Ecstasy Act, for the name under which it was originally proposed by then-Senator Joe Biden in 2002.) Dede Goldsmith, the mother of Mary “Shelley” Goldsmith, a University of Virginia sophomore who died after taking MDMA at Washington, D.C.’s Echostage in 2013, has launched a campaign to Amend the Rave Act in order to assure event organizers that harm reduction campaigns will not lead to prosecutions. Andrew Bazos is chairman of CrowdRx, a medical services company for large events like Bonnaroo, Coachella, Electric Zoo and Electric Forest, along with venues like Madison Square Garden and Yankee Stadium. From his perspective, harm reduction groups can raise complicated questions. “It’s a little bit trickier for a promoter to directly ally themselves with these entities,” he tells RS, particularly when it comes to drug-checking. “I don’t think we’re ready to be offering that as a free service at our shows, because there’s a tacit acceptance that drugs are okay if we do that. We don’t get into the politics of that.” Bonnaroo and Electric Forest recently seemed to distance themselves from groups like DanceSafe and the similar drug-checking organization Bunk Police, and have responded to tragedies at their events with a prohibitionist approach of increased gate security. The Zendo Project has trained 500 people since 2012, and helped about 700 guests, Ponté says. At this year’s Burning Man in late August and early September, they will have two locations for the first time, and a team of about 200 people – a number necessary for an operation that is open 24 hours a day. “The best-case scenario is when we can keep people from going to jail or going to the hospital,” she says, adding that they work closely with security and medical staff. Beauregard says he dealt with his fair share of difficult cases, including a woman who repeated the same few words over and over while “flailing” around on her back, whom he helped by surrounding her with pillows instead of demanding that she calm down or stop flailing. One of the most challenging cases, he said, involved a violent male who hit his colleague and began choking his girlfriend. They separated the couple and were able to talk the man down before he turned himself over to security. The Zendo Project has outlined four facets of psychedelic harm reduction: Create a safe space; sit, don’t guide; talk through, don’t talk down; and difficult is not the same as bad. Bazos’ CrowdRx takes a different approach when addressing difficult situations, using techniques which can include the administration of sedatives and even restraints. “We want to make the person safe for themselves and for others,” Bazos tells RS, adding that restraints may be employed when a doctor is not available to provide sedatives. Bazos notes that his company also employs plain-clothes individuals – medical or nursing students dressed in “non-threatening attire” – to give guests a “non-authoritarian” resource for assistance.